Although the Manchester Guardian was in agreement that the surrender of Lee was “so far as we can judge, admitted on the part of the Confederate Government their inability to prolong and organised armed resistance.”2 The Guardian also had a very high opinion of General Lee, reflecting earlier feelings of Britain as a whole, when they considered recognizing the Confederacy: “In thus acting he has been faithful to his character and his honour….His military reputation suffers nothing from succumbing to superior numbers, his patriotism shines the brighter” (ibid). So, now you know that the “real” end was when General Joseph E. Johnston surrendered at Durham Station in North Carolina some 17 days later on April 26, right? (Well, of course not, again.) While Lee’s army was perhaps the most famous, and Johnston’s army was the largest at the time, the surrender of both armies did not end the fighting or the Civil War. The New York Times claimed that “It is a privilege beyond all estimate that we are at last permitted to reckon this war among the things of the past.”4 But these surrenders were not to be the end after all. There were more armies still in the field, including General Kirby Smith’s west of Alabama. Even he was not to be the last Confederate General to surrender. 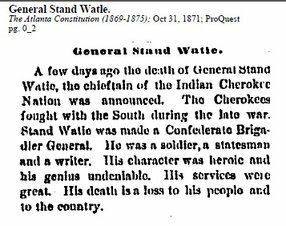 That general was not even a citizen of the Confederacy nor of the United States, although he commanded a regiment of nearly a thousand troops when he did surrender. Do you know who that General was? I will will reveal the answer in the next installment, but I will give you a clue: The surrender took place on June 23, 1865, in Texas. If you consider Texas as being part of the old Wild West, you might have expected to see him and his troops involved in hunting buffalo and migrating with the hunt. The surrender of that last significant Confederate army had an impact well beyond its size, as the terms of the surrender impacted not only his troops, but future generations. In fact, an outcropping of the final surrender terms only began to be played out in court cases starting in 2006. So, one can say that the surrender of the “faithful” Lee and the “wise” Johnston still have implications for today. It is amazing to see how events of history sometimes do not end with the event itself, but continue to have positive or negative impacts into our lives hundreds of years later. ProQuest historical databases, like Historical Newspapers (which include Civil War era Southern papers), American Periodicals Series, and History Vault give us a unique insight into first-hand history, and maybe a better understanding of today... which will be history tomorrow.